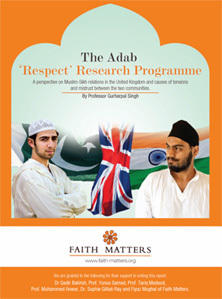 The Adab research, released by Faith Matters, called for effective dialogue between the two groups and for the two communities to “rediscover” their shared cultural heritage, including a common Punjabi heritage, history and culture. Funding for Muslim and Sikh organisations in areas with a significant presence of the two groups should be conditional on promoting cross-community relations between the two, particularly among youth and women, it said. Faith Matters founder and director Fiyaz Mughal, said the “collective amnesia” among the two communities must be addressed quickly.